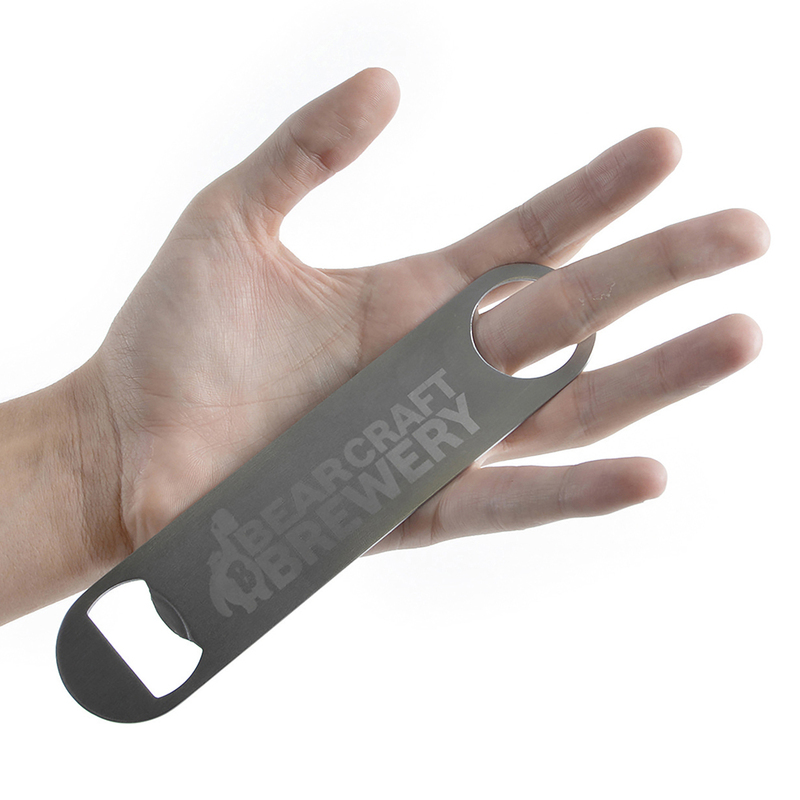 Model:GG0130 BOSTON Description: Flat silver metal bottle opener with rounded edges. Colour Options: Silver Product Data Specification Product Size 177 x 40 x 1 mm Product Weight Ink Colours If Applicable N/A Additional Information Price includes engraving to 1 position only. Price excludes Carriage & Origination. Lead Times 5 working days from artwork approval. Personalisation Data Max Personalisation Pad/Screen Print Area N/A Engraving Area 85 x 30 mm Full Colour Area N/A Embroided Area N/A Max Spot Colours N/A Foil Block Embossing N/A Notes Price includes engraving to 1 position only. Set up and carriage are additional. 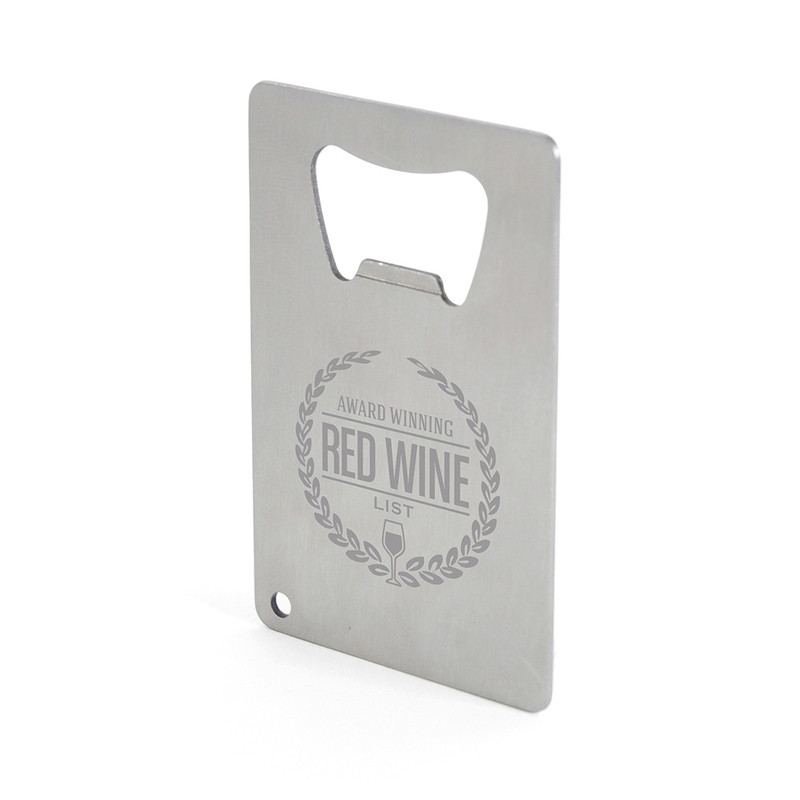 Model:GG0131 BRIMSON Description: Brushed metal credit card shaped bottle opener. Colour Options: Silver Product Data Specification Product Size 84 x 55 x 1 mm Product Weight Ink Colours If Applicable N/A Additional Information Price includes engraving to 1 position only. Price excludes Carriage & Origination. Lead Times 5 working days from artwork approval. Personalisation Data Max Personalisation Pad/Screen Print Area N/A Engraving Area 55 x 45 mm Full Colour Area N/A Embroided Area N/A Max Spot Colours N/A Foil Block Embossing N/A Notes Price includes engraving to 1 position only. Set up and carriage are additional. 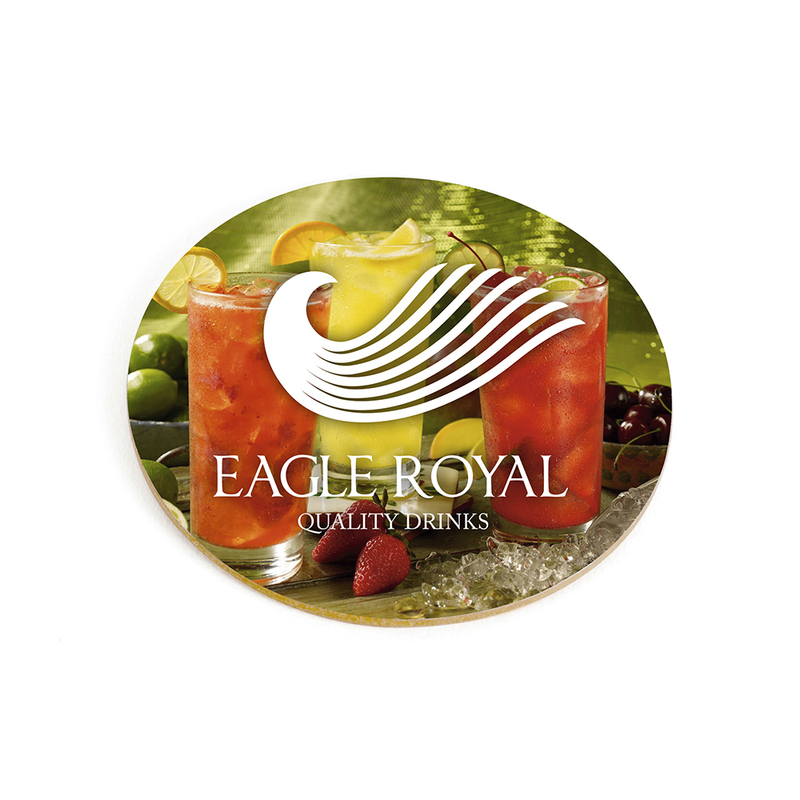 Model:RC0138 CIRCULAR CORK COASTER Description: Single circular coaster with traditional cork backing Colour Options: White Product Data Specification Product Size 93 mm dia. Product Weight Ink Colours If Applicable N/A Additional Information Price includes 1 colour print to 1 position only. Price excludes Carriage & Origination. Lead Times 5 working days from artwork approval. Personalisation Data Max Personalisation Pad/Screen Print Area 80 mm dia Engraving Area N/A Full Colour Area 93 mm dia Embroided Area N/A Max Spot Colours 1 Foil Block Embossing N/A Notes Price includes a 1 colour print to 1 position. Set up and carriage are additional. 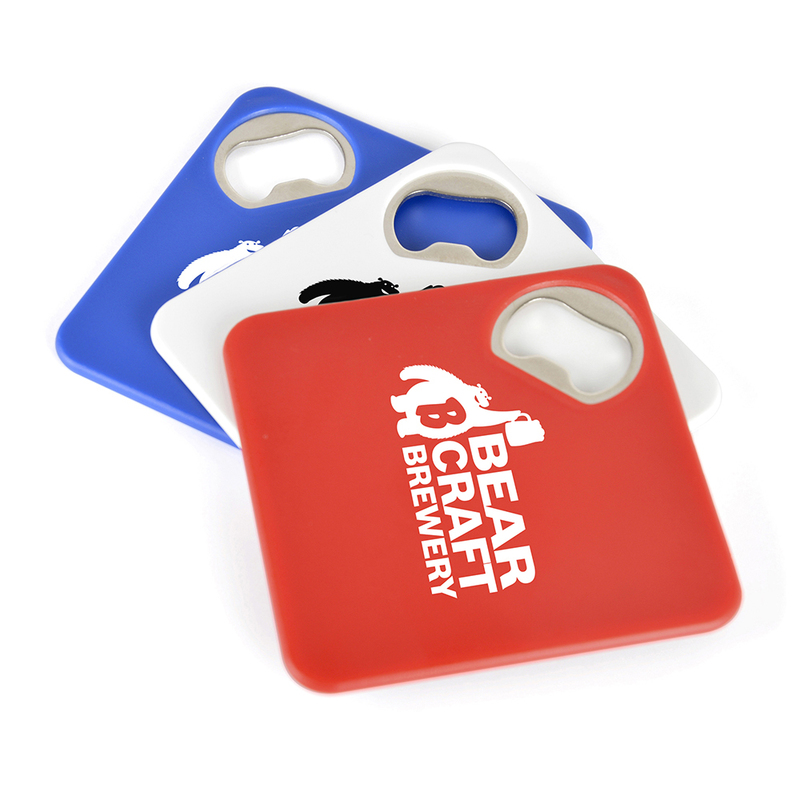 Model:RC0128 COASTER BOTTLE OPENER Description: Square plastic coaster with a built-in bottle opener in one corner and a foam grip backing. Colour Options: Blue,Red,White Product Data Specification Product Size 80 x 80 x 3mm Product Weight Ink Colours If Applicable N/A Additional Information Price includes 1 colour print to 1 position only. Price excludes Carriage & Origination. Lead Times 5 working days from artwork approval. Personalisation Data Max Personalisation Pad/Screen Print Area 71 x 71 mm Engraving Area N/A Full Colour Area 71 x 71 mm Embroided Area N/A Max Spot Colours 3 Foil Block Embossing N/A Notes Price includes a 1 colour print to 1 position. Set up and carriage are additional. 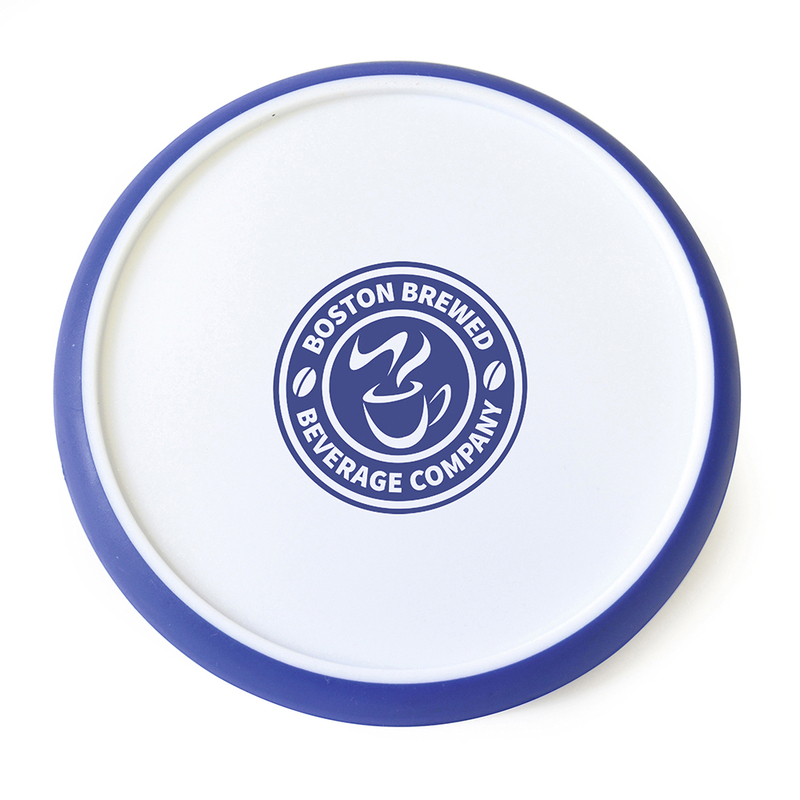 Model:RC0118 DISC COASTER Description: Circular white plastic coaster with coloured silicone edge for a better grip. Colour Options: Black,Blue,Red Product Data Specification Product Size 95 x 6 mm dia. Product Weight Ink Colours If Applicable N/A Additional Information Price includes 1 colour print to 1 position only. Price excludes Carriage & Origination. Lead Times 5 working days from artwork approval. Personalisation Data Max Personalisation Pad/Screen Print Area 35 mm dia Engraving Area N/A Full Colour Area 70 mm dia Embroided Area N/A Max Spot Colours 1 Foil Block Embossing N/A Notes Price includes a 1 colour print to 1 position. Set up and carriage are additional. 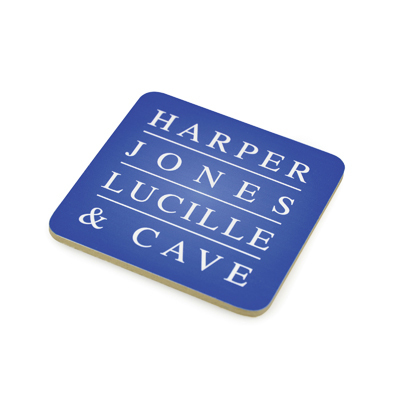 Model:RC0108 SQUARE CORK COASTER Description: Single square coaster with traditional cork backing for excellent heat insulation and better grip. Colour Options: White Product Data Specification Product Size 90 x 90 x 5 mm Product Weight Ink Colours If Applicable N/A Additional Information Price includes 1 colour print to 1 position only. Price excludes Carriage & Origination. Lead Times 5 working days from artwork approval. Personalisation Data Max Personalisation Pad/Screen Print Area 75 x 75 mm Engraving Area N/A Full Colour Area 90 x 90 mm Embroided Area N/A Max Spot Colours 4 Foil Block Embossing N/A Notes Price includes a 1 colour print to 1 position. Set up and carriage are additional.